On the 8th November 2018, the 7th annual PA of the Year awards took place at the prestigious Ivy Restaurant in London. Hosted by SecsintheCity – the UK’s only job site dedicated to Personal and Executive Assistants – the ceremony recognises and champions the very best talent and achievements in the industry. 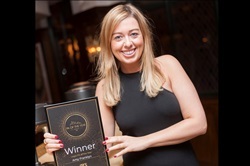 We asked Amy Franklyn, Legal EA at Bird & Bird LLP and winner of the Legal PA of the Year award, to give us a rundown of her career thus far and tell all about the glamorous awards ceremony. A: I always knew I wanted to have a career in Law, I just didn't know what. I started off at a US Law firm working for a very busy but supportive partner who saw my potential early on. I regularly attended client meetings with her and occasionally travelled overseas. Those were the days! I then worked my way up through the ranks I suppose. It hasn't always been fun and games though, I remember working in a firm where I didn’t see daylight for 7 months. In the office by 7am and rarely finished work before 10-11pm – sometimes later. It's not like that now. Q: What’s great about your job at Bird & Bird LLP? A: I would say my job at Bird and Bird is flexible. They are very supportive in allowing me to do all the additional things I like doing to enhance my own career and personal development. They have also been very supportive in allowing me to do further studies. I am currently studying Level 3 in Leadership and management which I am hoping to finish by summer 2019. I also speak at conferences, help PAs with career development and help clients with various projects. I have a great team of PAs who I manage who are highly supportive as well which helps a lot. They are fabulous. "The secret of getting ahead is getting started. The secret of getting started is breaking your complex overwhelming tasks into small manageable tasks and starting on the first one." Q: Did you always have an interest in law? What made you decide to become a Legal PA? A: Yes, I did. I loved watching crime programmes when I was younger. I initially went to university to study Law after my AS Levels and Legal Business Course but soon realised I didn't want to be a lawyer but wanted to be around them - so much so that I live with one! Q: The Judges praised you for establishing the Bird & Bird London PA network, can you tell us what made you decide to setup the network and how you went about it? What advice would you give to someone who wants to do the same in their business? A: As a manager, giving others the career opportunities development that I had is the most important thing for me. You must be able to motivate your team and keep them happy whilst trying to run a flexible but fair ship. I attended a couple of seminars where establishing internal networks were a key topic. I suppose it was a challenge for me, especially working in a law firm, so I decided to do what I could, and it just happened (obviously with a lot of work and a good team as well). Q: How did you find the application and interview for PA of the Year? A: I was shocked to receive the e-mail to say I had been nominated - so shocked that I e-mailed to check they had the right person. I didn’t know the awards existed. In fact, I was in the process of trying to create my own Legal Awards for support staff at the time with various contacts. Now, there is no need – they already exist. I really enjoyed the interview – the judges were so nice and genuinely interested in my role. There were smiles all round for the whole interview and I could tell the judges liked what I had done. At the end of the interview, the judges said they would see me at the Ivy. Have I made it to the next stage I thought? The answer was "YES". Wow, down to the final. I was so pleased, I immediately called my parents to tell them. Q: Tell me about the night itself? A: It was lovely – very well planned. I felt special. Everybody took the time to speak to me and congratulate me on my nomination. I met some other fabulous EAs who all deserved to be there. The food was delicious, as was the company. I was papped all night. Think Julia Roberts in Hollywood and you're there. She is my favourite, so she deserved a mention. The awards were done in reverse order so 3rd to 1st place. As the Legal award started, they began to read profiles of all the nominations. The first one started. My boss whispers to me – "that's not you"! The second started – we were unsure but by the time it had finished, he whispered again! "That is not you either, you have WON"! They started to read my profile and I looked at my boss and smiled. It was me! It was nice hearing somebody else talk about me like that – it is always nice when somebody recognises your efforts! A: My colleagues were pleased and said it was well deserved. They could all understand why I had won the award. I think it is safe to say there was an element of pride amongst them which was nice. I had a card from my bosses which was a lovely touch and some great messages from old colleagues, old bosses and old team mates. It really was a special time. A: Be positive, don't expect and just keep working. Even though you may not realise - your hard work and efforts are noticed by the right people. Try not to worry what others think, especially those that don't matter. If you have an idea, speak about it. Take risks and try it. It doesn't matter if you make mistakes – you learn from them. Always surround yourself with like-minded people who you aspire to be like. I did!